How do you make kids even more excited for Easter? 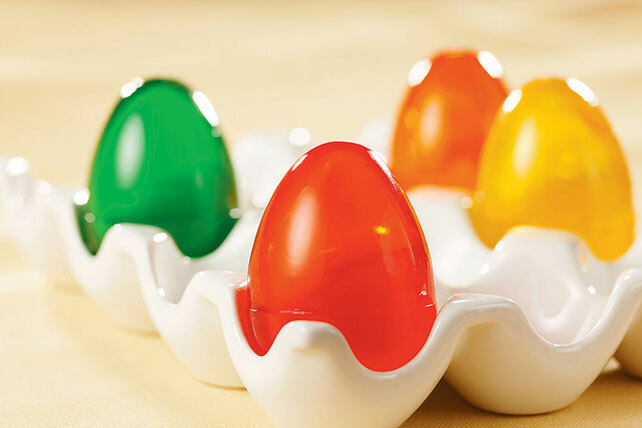 Make fun JELL-O JIGGLERS in the shape of eggs—and infuse 'em with apple juice for extra flavor! Use paper towel to wipe insides and along rims of both sides of egg mold with vegetable oil. (Or, spray with cooking spray.) Close mold, matching up rims of egg halves. Snap each of the egg halves together until firmly sealed. Place mold, fill-side up, on tray. Refrigerate 3 hours or until firm. Use dull flat knife to gently pry open egg halves. (Do not pull on handle.) Turn mold over and shake gently to release eggs. Keep refrigerated. Prepare recipe as directed, except spoon 1 Tbsp. raspberries, blueberries or chopped strawberries into bottom half of each egg mold before closing and filling with the gelatin mixture. Prepare gelatin mixture as directed, but do not pour into egg mold; refrigerate 30 min. Stir in 1 container (6 oz.) of your favorite low-fat yogurt. Pour into egg mold and continue as directed.